Select Size Small- 35" up to 50 lbs. Medium-42" up to 80 lbs. Large- 50" over 80 lbs. 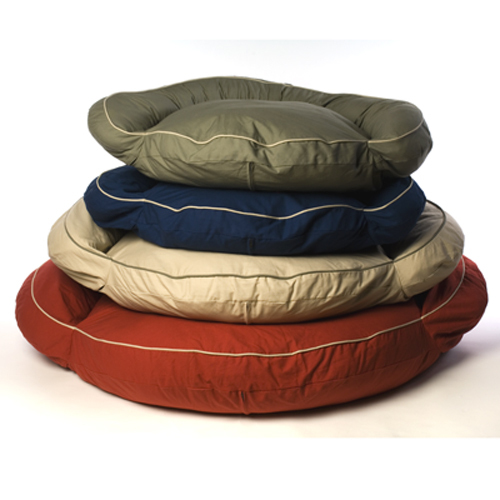 Sturdy twill surrounds the pillow like polyfil, perfect for snuggling in deep. Contrast cording completes the look. Removable, zippered cover is machine washable. Small- 35" up to 50 lbs. Medium-42" up to 80 lbs. Large- 50" over 80 lbs. Note: use these sizes as a guidline. For example if your pet likes to stretch out when he/she sleeps you may want to move up a size.